RTD will be recognizing its veterans and will also debut its commercial honoring veterans entitled, “Reconnect With Heroes.” The veterans bus will be on-hand to tour and additional discounts for veterans and seniors will be announced with a few other pieces of good news. 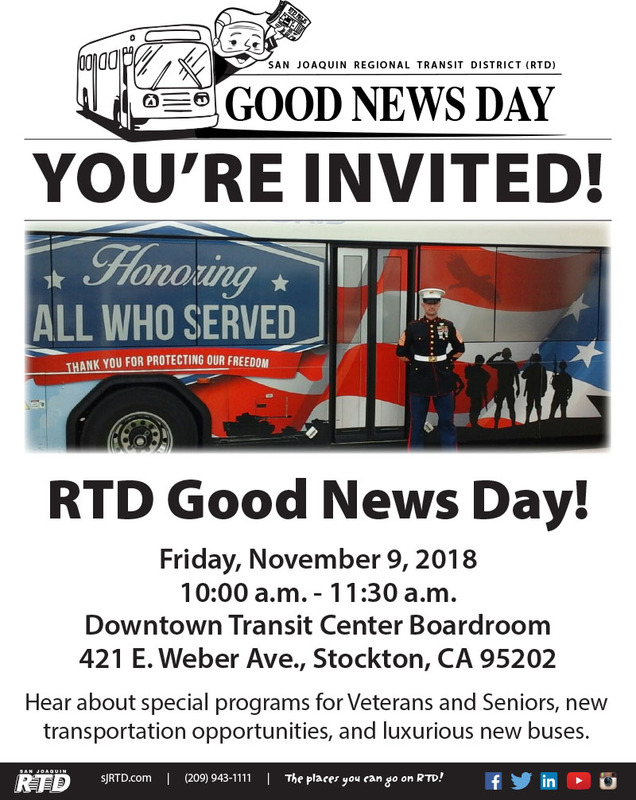 San Joaquin Regional Transit District (RTD) will host a “Good News Day” at the Downtown Transit Center in order to announce good news related extended service, vehicle upgrades, and discounts for veterans and seniors. In honor of Veterans Day, RTD has invited multiple representatives from the veteran community to speak. RTD will also debut its commercial honoring veterans entitled, “Reconnect with Heroes.” Tours will be available aboard its special bus honoring veterans and one of its new commuter buses; snacks and beverages will also be available. This event is free and open to the public.